Noticed the new header? I decided to give my blog a makeover so I turned to Emila of course. Despite her hectic schedule, she was kind enough to help me revamp my header and I simply LOVE it, thanks a million Emila! I’m proud to have this beautiful header here and I hope my blog will do justice to the magic you’ve added here with your creative touch! 2. I was featured by The Diva Network for a post that remains my favourite till today. 3. Adrian and I came up with the Magical Flying Carpet meme, which we’re both very proud of. Along with our Genie Buddy Emila, GP and GK would like to thank everyone who participated in the MFC! 4. I had my very first Mariuca Mug Contest, which saw Jesse as the happy winner! 5. It was A Great Pleasure for me to present the Mariuca Superstar Award to my friends. Created by B, this award is the first of more Mariuca awards I have in store for my loyal readers. 6. Emila made it to Genting, when she clinched one of the Top 5 spots for the All Malaysian Bloggers Project, so I was really happy to feature her here at my blog. Congrats Emila! 7. I became an aunt to a beautiful baby girl, Isabella! 8. My dear friend Janice lost her brother to cancer. It was a sad day for everyone and it was truly touching to see so many people showing love for Janice during her absence. 9. I almost lost the spirit to blog thanks to a certain incident that till today left me wondering how it all went awry. 10. I participated in NAFA’s Fight Against Child Abuse, one that I feel strongly for as it involves the murder of Nurin Jazlin. YAY! LJ, despite the problems u had to leave a comment here, u still managed to be my first commenter! It has been a pleasure knowing you:) Congrats! Yay Happy Anniversary to u our dear friend, and many many congrats for your new post. And your new look! Solid gold!! We love it. Wah! Solid gold it seems, I'm so happy!! Thanks NAFA, it took me quite a while to get everything just right, glad u like it! Congratulations and Celebrations, Marzie!!! A new milestone. Your new header nice. You are a true Superstar . Wah... I like the sound of a new milestone Uncle Sam! Thanks for coming by and for ur friendship too. Happy 1st Blog Anniversary. U'r previous look was really good. i some how liked that previous look with all the ads & widgets towards the right hand side. now it is in left hand side. not so impressive tht tht gal logo. & the colour combination. you had made the blog open by invitation mode yesterday night i suppose. i got frustrated & commented privately at myblog log. don't know whether you read it. but kindly let us know when ever u r going to do any such thing. also kindly give me u'r mail id to my mail. Happy 1st yr blog anniversary. Jean!! Thanks for coming over to wish me yay! Oh yeah, I love my new header too and I'm very pleased with my new layout, everything seems neater. I have B to thank for my Award Gallery, he did a nice job for me! Gone were the day where you have to write your own HTML :) HTML 4.1? and you see those pages display welcome to my homepage? or some test scripts displaying "hello world!" Happy anniversary and keep blogging! Thanks for visiting Netster! I'm so glad I never had to write my own html for stuff, that would have been a disaster LOL! Happy Anniversary Genie Princess! It surprises me that it has only been one year for your to reach the status of a Royal in Blogosphere! Keep up that good spirit of bloggoing and friendship! I am a fan of your good site! 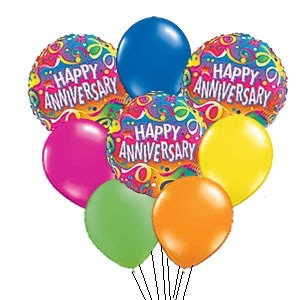 Happy Anniversary Mariuca! I remember when I first started out not too long ago, I found your avatar everywhere. Now I know why, because you have so many good friends that support you and love you. See you again in another year! Woohoo! Congrats on the anniversary! I love your blog's new look! Love the blue color theme as well! Glad you like the header dear! Have a great weekend! Luv ya! Congrats Marzie... it's been a really eventful 100 posts hasn't it? I went to read your favourite post again... and I think I love it as much as you do. Thank you for writing. I will be here for your 200th post too!!!! Congrats Marzie! Got a new look and everything! I like it and what a perfect time to to do it. Whoa 200th post, that's like a long way to go he he he! Thanks for coming by Bobby! It took me quite a while to rearrange everything, glad u like it! PS. Why so glum? How can I cheer u up Charlie? Happy Anniversary to one of my favorite artists around!!! Congratulations!!!! Hi GP! Nice!!! Happy Anniversary! :):) Glad to have been a part of your journey as a friend and Genie King. Thank you very much Nick! It took me hours to get my new template up and running, even worse than the first ever meme we did that was so darn difficult LOL!! Yay, Jan is finally here!! My blog loads pretty fast on my end, hopefully it'll be better for u tomorrow! GP! Well it comes from a magic fountain that has no source and actually floats like a well in mid air in that is suspended in a crystal clear container. And the water can only flow when I push a lever to release it! Cool or not! Wifey says that its a mineral water dispenser but I don't believe her!! Happy anniversary! Keep it up! You have been very busy, haven't you? Congratulations on being able to write so many posts and for keeping the blogging flame alive after so long! Man, i've got to check when my blog was first created. I want to celebrate blog anniversaries too. Haha.. and get someone to revamp my site for the occasion. p.s. Keep the flame going forever and ever and ever and.. you get the point. i am at my 100th post too! Come and celebrate my 100th post with me and collect your award! mariuca : hi there,I found quite difficult to view ur blog as there is loading problem since u shift to this new template.wonder if it is just me or wat..by the way..I am sorry coz i dun have much time to enter the contest currently is on..and you shall check at my blog about my dear's photo as what i promise earlier..
Congrats! with just 100 posts and you are PR 4! Great stuff marzie! glad you like the new header! It's a lovely header Emila! !